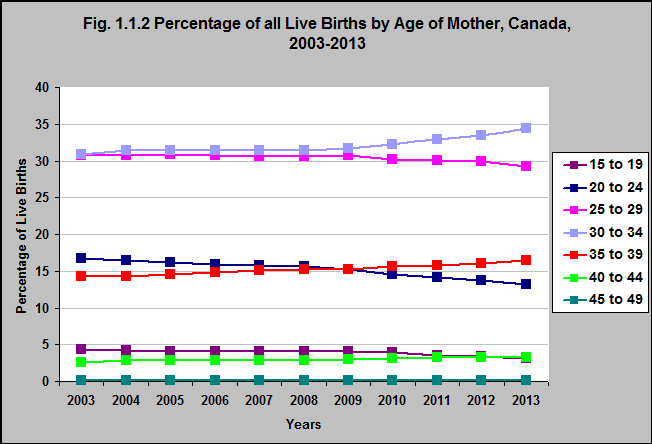 Between 2003 and 2013 the percentage of live births to mothers aged 30 to 34 and 35 to 39 increased. While the percentage of live births to mothers aged 20 to 24 and 25 to 29 decreased, so did the percentage of live births to mothers aged 15 to 19 years. 1Bushnik, T., Cook, J.L., Yuzpe, A.A., Tough, S., & Collins, J., (2012).Estimating the prevalence of infertility in Canada, Human Reproduction, 27, 738-746. https://www.ncbi.nlm.nih.gov/pubmed/22258658 -accessed July 15, 2017.